The McGowan Institute for Regenerative Medicine has racked up some impressive numbers in its 25-year existence. Researchers affiliated with the McGowan Institute have had 140 patents issued, filed more than 900 invention disclosures; had their technology licensed more than 170 times and have spun out nearly 30 companies from the University. 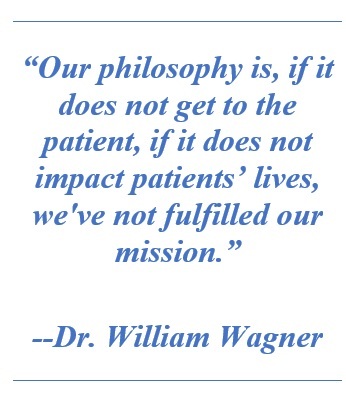 The Innovation Institute sat down with the McGowan Institute’s Director since 2011, William Wagner, PhD, to discuss the reasons behind its success and what exciting things are happening in its labs that are changing the way patients are treated for a wide range of diseases and injuries. Dr. Wagner is a Fellow of the National Academy of Inventors (NAI). He has also been involved in six licenses or options of Pitt technology, including three with the startup company Neograft Technologies, which is developing new treatment options for coronary artery bypass surgery. McGowan recently celebrated an anniversary, is that correct? WW: Depending on how you count, we’re 25, now 26 years old. That goes back to the McGowan Center for Artificial Organs, starting in 1992. In 2001, we became the McGowan Institute for Regenerative Medicine, but there is a continuity there. The artificial organs and the regenerative medicine, it’s really attacking the same problem, which is organ and tissue failure. In 2001, we recognized that artificial organs, per se, were one way to do this, but what we really cared about was solving the problem. At that point, stem cells, tissue engineering, and regenerative medicine all offered clear promise to attack this problem. It made sense for us to bring like-minded groups, working on similar problems around organ and tissue failure, together in this new Institute. So where is the McGowan Institute located? WW: We have two primary buildings. We have the McGowan Building, which is on the South Side, across the Hot Metal Bridge, and that space is focused on medical device development and preclinical testing. We also have Bridgeside Point II, on Second Avenue, where our floor is focused on tissue engineering bio-materials and our administrative core. We have 250-plus faculty, scattered across campus, primarily in the health sciences schools, and engineering school. We even have a small group at Carnegie Mellon University, and a couple at Duquesne University, so we reach out beyond the university to integrate like-minded individuals. McGowan-related faculty and students have generated a significant amount of intellectual property and have disproportionately had their discoveries licensed from the University where they are impacting people’s lives. Why is that? WW: Our philosophy is, if it does not get to the patient, if it does not impact patients’ lives, we’ve not fulfilled our mission. So, our mission is not to publish great papers in Science and Nature or other excellent scientific journals. We do that, but our real objective is to get the technology to the patient. That means you have to focus on things that have a finite timeline, and that are going to address a problem for which you’re going to be able to get reimbursed for, and represent a significant improvement over the current state-of-the-art, or the competition. All these kinds of things come in to play, and it’s a layer on top of the good fundamental science being done in our labs. This objective means there is probably going to be a business involved. If a business is going to be involved, there’s going to have to be a profit. For there to be a good solid business plan, there needs to be intellectual property. There has to be a notion of what the patent landscape is. There also needs to be a concept of what the regulatory pathway is going to be. It even gets into, for our technologies, things like what the sterilization process will be and the ability to manufacture biological products. So, over the years we have become very good at understanding the commercialization process and providing our faculty and students with the knowledge and resources and mindset to be successful. For example, we have legal and regulatory consultants that we interact with all the time here, plus a great relationship with the Innovation Institute. With the track record that you’ve established for commercial translation, has that helped recruit students and faculty to McGowan? WW: For sure. We have the reputation in the field of being very translational. Part of that is because from the beginning, we’ve always been known for engineering and medicine, tightly linked together. So much so that our engineers, when you talk to them, sound like clinicians some of the time. The clinicians, when you talk to some of them, will talk about bio-mechanics at a level that you wouldn’t normally expect. So that’s a key part of who we are, and we tend to attract those kinds of individuals who really want to be right on the edge of that clinical science/engineering interface. When you’re there that’s when you’re going to understand the problem well enough from a clinical perspective and an engineering perspective that you know how your new idea fits in with the current state-of-the-art. There have been some policy changes at the operational level of the University that makes it easier for faculty to be involved in startups coming from their research. What’s the impact of that? WW: I was fortunate to be part of the committee that was evaluating how we might be able to shift the posture of the University. We did a benchmarking study where we saw where the University ranked compared to our peers. The upper administration wisely said that we don’t necessarily want to be in the middle of the pack, but rather we want to be at the avant-garde. Now, quite simply, the attitude is, “Let’s figure out a way to make this work.” That change in attitude has meant a lot to us. Our number of spinouts from the McGowan Institute markedly jumped last year as a result of these changes. Now we’re able to have our thought-leaders participating in startups, and it turns out that the people who are investing in the companies really want to see that. They want to see the inventors still engaged … not necessarily leading the company, but closely there to help navigate the technical challenges. What are some of the things that your clinicians and engineers are working on that you’re really excited about coming out of McGowan in the next few years? WW: A general project area that we’ve been working on from the beginning, from the 90’s, has been technologies around circulatory support and heart failure, be it from congenital defect in the neonatal population, or adults, secondary to a heart attack, as well as pulmonary failure due to a variety of diseases or conditions. The technologies that are coming out now continue to get more and more sophisticated. We were part of the development of the most implanted ventricular assist device in the world today. But it’s nearing the end of its life span now. New technology’s coming. We have people across our labs that are working on that next generation. We have people taking widely diverse approaches in other areas of regenerative medicine; people working on growing liver tissue in lymph nodes for liver failure. We have technology that’s transitioning into private industry right now for peripheral nerve damage. We are also developing tissue-engineered heart valves, that would go into a young patient, and instead of having to be replaced in 10 or 20 years, or instead of having that patient have to take anti-coagulation medicine for the rest of their life, it would be something that would turn into their own tissue and grow with that patient. A number of individuals working on that topic area. And that is just the tip of the iceberg.